What do these two titles have in common? Well, more than you might initially think. As many of you know, Geoff and I took a brief, four-day vacation to celebrate our 28th anniversary. We wanted to do something close and relatively inexpensive, so we decided on a trip to the St. Louis Zoo (fabulous! ), the Art Institute of Chicago (amazing!! ), and a brief stop at the Field of Dreams on our return trip home. Now to illustrate how influential book blogs are…..last week was the awesome Audio Book Week celebration. I was so caught up in the excitement of reading the praises of this literary medium, that I immediately reserved about three different books to take with us on our trip. This is the first time that we have traveled while listening to a book, and both of us thoroughly enjoyed the experience. At the outset of the trip we decided to start with Bill Bryson’s memoir of growing up in Des Moines, Iowa in the 1950s. I have not (yet) read anything by this author, but Geoff had just finished A Walk in the Woods and thoroughly enjoyed it. I knew that as a first audio book experience, it would be best for us to try a rather “light” read. This was the perfect choice! a tornado was referred to as a killer apostrophe — isn’t that a perfect metaphor! 1957: we were entering a world where things were done because they offered a better return, not a better world. The entire memoir is one in which this time period in America is looked back upon with great fondness. What we did not realize, however, is that Dyersville, Iowa – home of Field of Dreams – is very reminiscent of the Iowa to which Bill Bryson refers. In fact, from the moment we crossed over the Iowa border from Illinois we felt as though we had been teleported into another era. The farmland is so lush – tall, dark, green cornfields are neatly planted and obviously well-tended; every farm looks freshly painted, with pruned bushes in the front and a white picket fence all around; each town we drove through at 35 miles an hour reminded us of the fictitious Mayberry of the Andy Griffith Show. 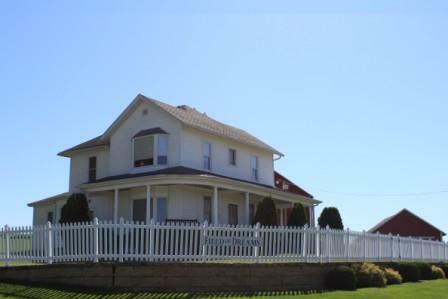 Once in Dyersville I noticed that each house in town was manicured in the same impeccable manner as the farms that were on the outskirts of town. Every other house displayed the American flag with great pride. It was a breath of fresh of air – both literally and figuratively. Since we didn’t arrive until after the field closed on Sunday night (it is a working farm and the Lansing family requests that all visitors leave by 6:00pm), we decided to visit the site first thing Monday morning. As we were driving to the location at 9:05, I kept thinking that we were going to be the first ones there and I would feel a bit conspicuous. Well, those fears were unwarranted. The field opens at 9:00am and when we arrived at 9:15 there were already several cars parked and more coming in after us. Here is the most amazing thing to me: this attraction – devoid of video games, bright lights, flashing signs, and latest gimmicks – was appealing to every demographic component in America. There were families with young children playing catch in the side yard; there was a group of about 4-6 older gentlemen (I would guess 68 to 70 years old) who were taking turns at bat while a young teenage boy from another family served as the pitcher. Even Geoff got into the pick up game by playing catcher for a few minutes. Time stood still and it was the most magical experience I have ever had the opportunity to witness. The Field of Dreams is open to the public free of charge. 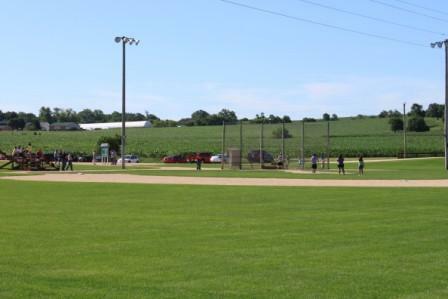 You are welcome to walk all around the baseball diamond – out to the cornfield and beyond. For a suburbanite like myself, I have never seen corn stalks up close and it was wonderful to walk along the pathway surrounded by 5 foot plants. I must confess that I think both of us were a tad bit disappointed when we did not suddenly disappear as we walked further into the field. There is a part of me that truly wanted this to be a pathway to Heaven. While I do not think that this attraction is worthy as a destination location (it is a 7 hour drive from Kansas City, but was only a 3 hour trip from Chicago), I would most definitely recommend it to anyone who is traveling within 2-3 hours of Dyersville. It takes you back in time — to the 1950s that Bill Bryson talks about – a time when the television was only turned on after dinner; when talking on the telephone was limited by the length of the cord; when kids spent the summer outside riding bikes, splashing in the swimming hole, and playing a pick up game of baseball; and when parents would pack a picnic lunch, cheer in the stands, and stay focused on the game. I'm so glad you finally read/listened to some Bryson!! He is one of my all-time favorite authors because he does get the anecdoes and "education" part just right and writes so enjoyably. I bet this was a good audio for this trip! Thanks for sharing the photos … and it is nice to hear that it remains unsullied by commercialism. That sounds like the perfect pick for your first audio book. I read the book pre-blogging days and it made me sad that we've allowed big box stores to take over our landscape. Your trip sounds magical. Bill Bryson is a great read, whether by turning the pages of hearing his words aloud, and a wonderful way for a couple to "read" while on a long drive. We just heard an MC Beaton book while driving back and forth to MN to see our daughter. A great way to pass the time on a long trip. Sounds like you had a good anniversary. Sounds like a nice few days away Molly. The Life and Times of the Thunderbolt Kid is one of my favorite Bryson books; the audio was so funny. I am a big fan of Bryson (especially on audio) so I am glad you have discovered him! I haven't read/listened to "Life and Times . . . " yet but will definitely read it soon!